Compliance is crucial to any business. Failure to follow industry regulations puts your business at risk for steep fines, as well as the loss of licenses, business and reputation. However, not all businesses have the resources to keep up with ever-changing regulations, let alone manage, communicate and enforce all aspects of compliance across their entire organization. IPACS® (Integrated Performance Audit and Compliance Software) is a powerful SaaS compliance management system built for your budget. 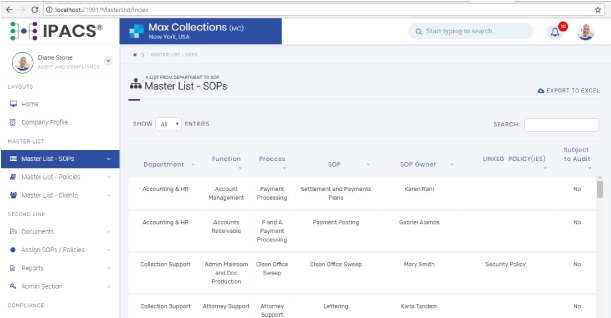 Free to implement, managed by Provana and customized to your needs, IPACS® automates and centralizes key compliance tasks to help ensure your business adheres to industry regulations and state and client requirements. IPACS®’ modular design allows you to adopt the functionality you want, then add on more as needed. That a la carte approach, combined with free implementation, makes it possible for any size business to get enterprise-grade technology – and without the need for IT infrastructure and staff. Efficiently manage policies and procedures in a central location with automated version control and online approval, saving more than 30% of the time it would take to perform the tasks manually. Easily present employees with the latest versions of documents, notify them of changes and track their acknowledgments. Automate the administration of compliance training and testing through customized test schedules and in-platform testing. Prebuilt reports automatically notify you of lapsed certifications, delinquent users and test scores. Automated scoring saves hundreds of hours each quarter. Manage internal and external audit calendars in a central location and create automated alerts to inform you of upcoming audit milestones. You can also track nonconformities and take corrective actions to demonstrate a remediation process. 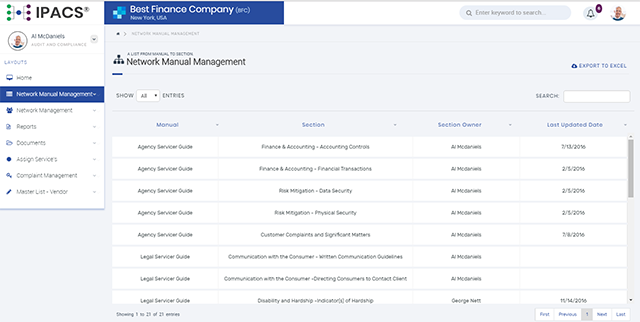 Create customized compliance documentation requirements for third-party vendors, complete with automated alerts for missing or expiring documents. 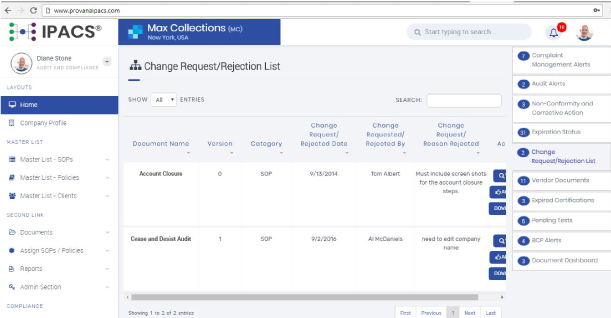 You can also set up third-party vendor audits with alerts for upcoming audit milestones. Customizable complaint logs allow you track and manage consumer feedback in a centralized online location to ensure timely resolution. Analytics offer data-rich insights, allowing you to identify trends, improve issue resolution and reduce complaints. Create and deploy a robust business continuity plan with clear ownership and better awareness of tasks across your entire organization. Easily print and test plans to help identify oversights and gaps. 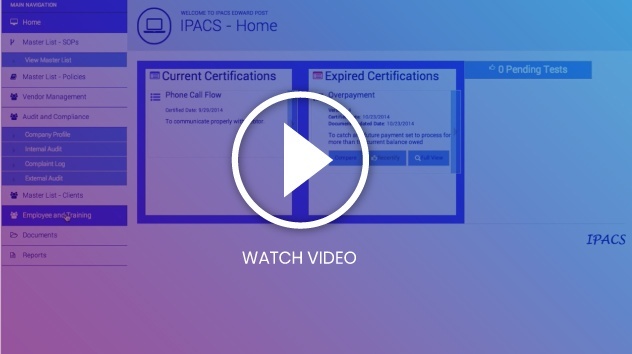 IPACS®’ external compliance modules connect you with your vendors, providing intelligent reporting and timely alerts that make it easy to track, manage and maintain oversight of partners and service providers. Store and manage operating standards and instructions for service providers in a centralized location with automated version control and online approval. Publish changes to your entire network automatically, and allow service providers to receive alerts when updates are made and acknowledge them in IPACS®, providing a clean audit trail. Remote access to a service provider’s IPACS® instance allows you to maintain vital records and documents and import them into your own instance. You also have the ability to view vendor policies, procedures and test results, and receive expiration alerts. IPACS® simplifies network audits by streamlining the process of sending and reviewing questionnaires and automating audit report generation. 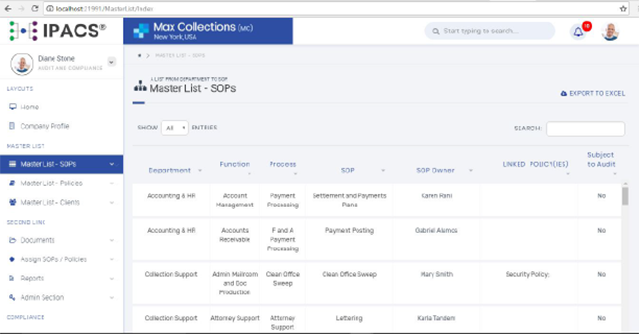 You also have the ability to manage vendor audit calendars, set alerts for pending audit activities and provide audit assistance, such as providing missing compliance documents. 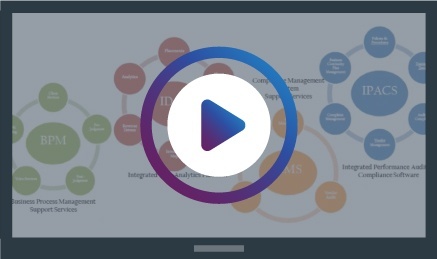 Get a secure real-time view of vendor complaints when they’re logged. 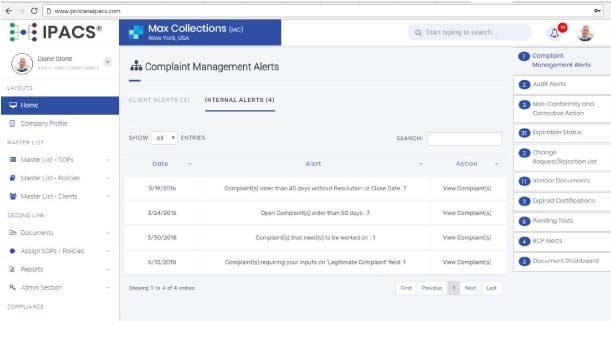 Receive alerts for new complaints and complaints at defined stages. In-depth reporting features allow you to identify complaint trends within your network and with individual service providers. IPACS® offers customized dashboards that deliver key compliance metrics and data. 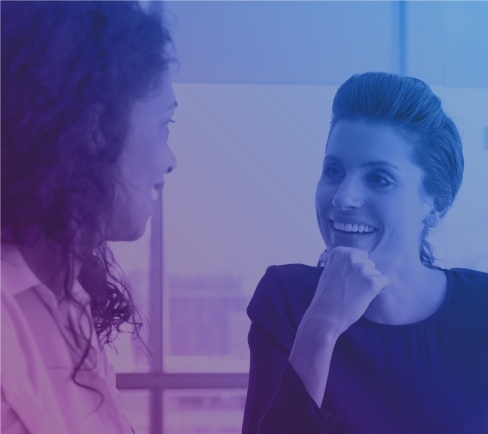 Powered by Microsoft BI, the in-depth business intelligence provides invaluable insights and trend analysis that can be used to improve network compliance.